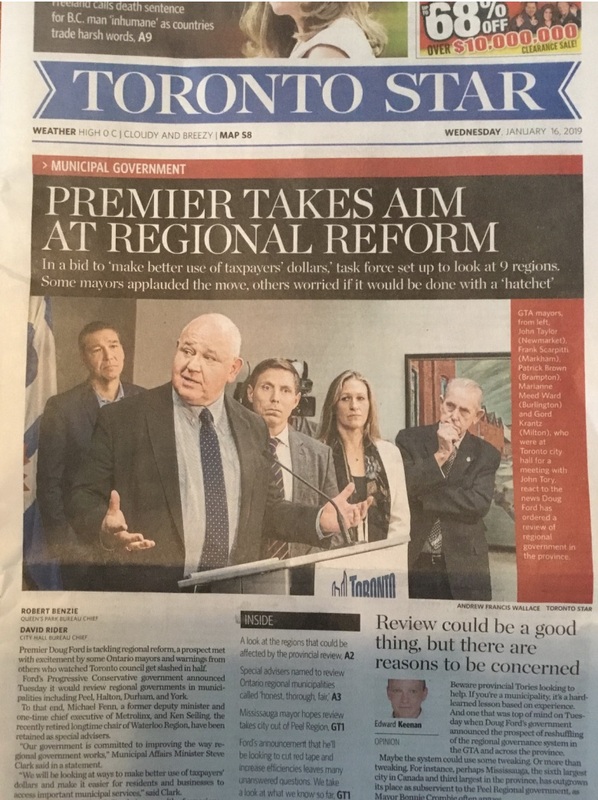 Will York Region and Newmarket survive in their current form following Doug Ford’s review of Regional Government that was announced yesterday? The Government has appointed two advisers – Ken Seiling and Michael Fenn – who clearly are working at breakneck speed to deliver “reform”. They began work on 20 December 2018. Their appointment was announced to the press and public yesterday (15 January 2019). They will submit their work plan to the Ministry of Municipal Affairs by Friday (18 January 2019) and their “detailed consultation plan for the review” by Thursday 31 January 2019. Their recommendations will be submitted to the Minister by “early summer 2019” which could mean late June or early July. Is this even remotely feasible? Is the decision-making (mechanisms and priorities) of upper- and lower-tier municipalities efficiently aligned? Does the existing model support the capacity of the municipalities to make decisions efficiently? Are two-tier structures appropriate for all of these municipalities? Does the distribution of councillors represent the residents well? Do the ways that regional councillors/heads of council get elected/appointed to serve on regional council help to align lower- and upper-tier priorities? Is there opportunity for more efficient allocation of various service responsibilities? Is there duplication of activities? Are there opportunities for cost savings? Are there barriers to making effective and responsive infrastructure and service delivery decisions? The whole half-baked exercise is classic Ford. A dramatic announcement sprung on us without warning. An absurdly compressed timetable. And a result that is pre-ordained. Ford is proposing major changes to the planning system - dressed up as cutting red tape when in reality it is about cutting corners. We shall have to wait for the small print. But Ford has a habit of speaking with a forked tongue. As we recall, during the Provincial election campaign Ford was memorably caught on camera promising he was going to open up chunks of the Greenbelt to development.